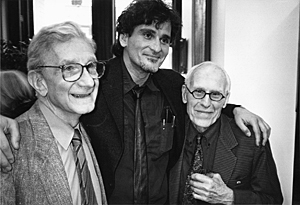 Alan Kaufman, center, author of the memoir Jew Boy and editor of the Outlaw Bible series, with legendary editors and publishers Fred Jordan, left, and Barney Rosset, right. 8:32 a.m., July 24, 2009----The University of Delaware Library has acquired the papers of poet, memoirist, novelist, and painter Alan Kaufman, who is associated with the Spoken Word movement and the exploration of Jewish identity through contemporary alternative culture. Kaufman, who presently resides in San Francisco, is the son of a French Holocaust survivor. He was born and raised in the Bronx in the 1950s, and now holds Israeli, French, and American citizenship. He moved to Israel in 1977, served in the Israel Defense Forces, and traveled extensively before arriving in San Francisco in 1990. He was active in the “live poetry scene” at Café Babar in San Francisco's Mission District where the honesty of a writer's delivery and measure of the audience's response reflected the immediate success of a work and invigorated a generation of new poets. After his involvement with the 1993 San Francisco Poets Strike, Kaufman helped raise the visibility of poetry slams and Spoken Word events by organizing national and international readings. At the same time he was gaining recognition with a group of California writers and performers, Kaufman tapped into an emerging Jewish avant-garde cultural stream. In 1995, he joined with Hoboken-based Danny Shot to co-edit It's the Jews! A Celebration of New Jewish Visions, which was a special issue of collected underground Jewish works. Shot held an East Coast publication party and Kaufman held one in San Francisco; both drew large crowds and brought recognition to young Jewish readers seeking new forms of expression. Kaufman joined with another group of like-minded friends and became editor-in-chief of Davka: Jewish Cultural Revolution, a short-lived but influential alternative magazine. Continuing to explore his Jewish “otherness” and “outsiderness” and underground American literature, Kaufman edited The Outlaw Bible of American Poetry (1999), a landmark volume followed by two more “outlaw bibles” of American literature and essays. His forays into these areas also led to a critically acclaimed memoir, Jew Boy (2000), and a novel, Matches (2005), inspired by his military experience. Kaufman's writing has also appeared in two anthologies of writings by descendants of Holocaust survivors. Further, he edited The New Generation: Fiction for Our Time from America's Writing Programs and writes reviews for the San Francisco Chronicle and Examiner, Salon, Los Angeles Times, Partisan Review, and Tel Aviv Review. He teaches classes about memoir writing and journalism at the Academy of Art University and other workshops in San Francisco. Well established in his literary career, Kaufman is also gaining recognition as a painter of haunting portraits. The Alan Kaufman papers, 1900-present (bulk dates 1985-present), comprise 14 linear feet of correspondence, artwork, books, posters, typescripts of essays and poetry, photographs, periodicals, original artwork, and books. The collection, located in Special Collections on the second floor of the Morris Library, includes comprehensive files related to Jew Boy, Matches, the Outlaw Bibles, Davka, and other writing projects, altogether providing rich documentation for study of this influential writer, the Spoken Word movement, and contemporary Jewish literary counterculture. Holdings of the Special Collections Department of the University of Delaware Library include books, manuscripts, maps, prints, photographs, broadsides, periodicals, pamphlets, ephemera, and realia from the fifteenth to the 21st century. The collections complement the general collections of the Library with particular strengths in the subject areas of the arts; English, Irish, and American literature; history and Delawareana; horticulture; and history of science and technology.